so i dunno what's causing it but would like to work on getting it fixed. It's the first time this error has been reported. I know the behavior of the KB used to be when I post an article. It would show my summary with a "read more" link in the forum post. If I update an article, it would say in the forum with an article updated post. As you could see, it does neither. As soon as I have some free time I'll check on my local testing environment. Can someone confirm this bug as well please? The KB-article doesen´t shown in the KB-forum. I´ve tried out different styles and templates, but the problem already exists. In the forum only is shown the KB-Article title but not the artikle-text. now i have looked into my database. 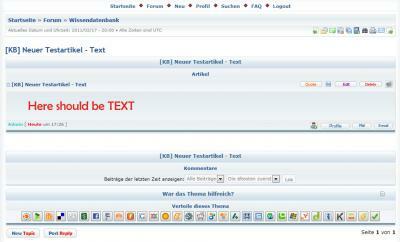 In table "ip_posts" and table-row "post_text" are no entries about KB-articles, only normal forum-artikles. In table "ip_kb_articles" and tablerow "article_body" are the KB-article-texts correctly written. 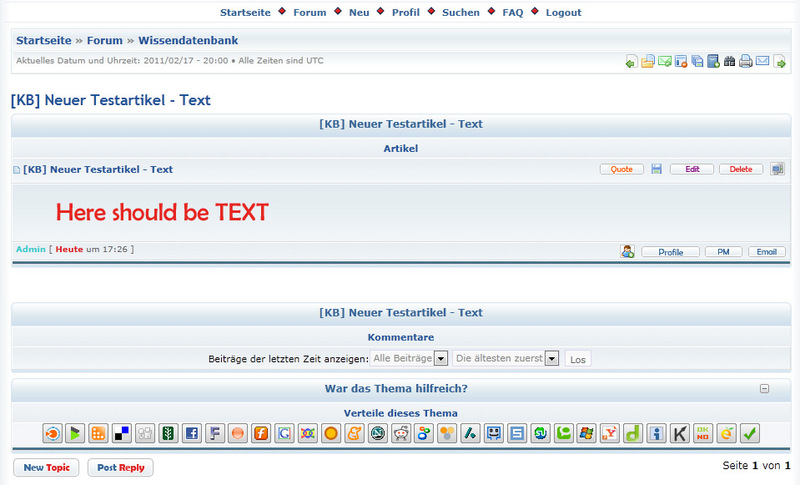 But in viewtopic you can not see the text.